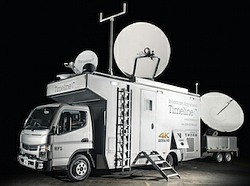 Timeline in London, UK to launch second 4K UHD uplink truck. London, January 2018: Timeline Television, a major provider of outside-broadcast, post-production, and studio-based services for all major UK networks, is launching a second 4K UHD RF uplink truck. Due to growing demand, a second 4K RF uplink truck will be launched in 2018 to enable Timeline to support clients’ growing 4K requirements. RF1, Timeline’s first 4K uplink truck, launched in December 2016 and completed over 80 outside broadcasts in its first year, including 3 months in Mallorca for ITV’s Love Island. The truck, designated RF2, will be the latest addition to Timeline’s 4K fleet and will be designed and built by Timeline Television. It will incorporate the very best 4K technology from manufacturers across the industry. The 5 Tonne purpose-built 4K RF uplink truck provides a dual chain 1.8m Advent Newswift antenna capable of delivering multiple UHD and HD uplinks. RF2 also has a 1m Cobham Explorer 8100 KA antenna for remote data services and video over IP. The auto-deploying and tracking KA Band antenna enables connectivity to be achieved in a matter of minutes, ensuring that bidirectional communication can be established and guaranteed. A 196 bidirectional port Vega router enables 4K video to be managed with ease. A large monitor stack, Dolby sound monitoring and ASI/spectrum analysis provide complete confidence monitoring. RF2 is equipped with a 9m Telescopic Mast with 35Kg of headload, allowing various antenna to be mounted. As well as being a traditional RF uplink truck RF2 has been designed to be flexible and completely customisable to clients’ needs. Uses range from a complete outside-broadcast unit to a communications hub to a newsgathering uplink truck. RF2 is set to launch in quarter two of 2018.